Home Mobile Applications 10 best gacha games and mobile RPGs for Android! Gacha games are fairly popular these days. The most popular ones have millions of installs and even the smaller ones have loyal fans. The games have a specific style of play. They usually have old school, jRPG combat mechanics along with very long story lines, various types of special events, and sometimes there is online multiplayer. However, the hallmark feature of a gacha game is the gacha element. You summon characters with in-game currency or in-game items (often called character pulls or just pulls). You get a chance for super powerful stuff or complete trash. Some are friendlier with this mechanic than others and that helps separate them from the pack. With that in mind, here are the best gacha games (mobile RPGs) for Android! Please note, freemium games change all the time by adding new events, characters, and mechanics. Most of what we have written here should still apply, though. We do have more traditional, console-style RPGs in the widget just below if you want to try those too! The Alchemist Code is a popular mobile RPG. It uses strategy RPG mechanics instead of the usual jRPG mechanics. That means you move units around the board to attack the bad guys. The game also includes 50 collectible characters, a multiplayer co-op mode, various special events, and competitive PvP. It seemed fairly free-to-play (F2P) friendly to us during our testing. However, we can see the argument going either way. The game is supported by a decent soundtrack, good graphics, and plenty of stuff to do. It’s not half bad. Azur Lane is one of the newer gacha games on the list. It’s also a riff off of the popular Kantai Collection game in Japan. We usually try to give credit to the originals, but Kantai Collection isn’t available in many places outside of Japan. You summon characters like normal, except every character is a girl that turns into a tank. You form flotillas and beat up on the bad guys. The game features over 300 characters, tons of stuff to do, and a lot of the usual gacha game fair. We also hope Kantai Collection eventually makes its way to a full global release. Dragon Project is one of the most friendly games for F2P players. The game throws all kinda of stuff at you. Those who grind hard enough can get really good stuff fairly quickly. The game also features decent 3D graphics, jRPG combat mechanics, various events and leaderboards, and the usual long story line. The game has a history of laggy performance and Internet connectivity issues. However, they are intermittent. The game played okay during our testing. This is also an excellent game for those who are new to the genre and want something nice and easy to start with. Fate/Grand Order uses the mammoth cast of the popular Fate anime series. Thus, fans of the series should get a good kick out of this one. The game features a surprisingly engaging story line and soundtrack. Additionally, you get tons of units to summon, plenty of special events, and decent, anime style graphics. Most of the complaints we’ve found are the differences between the Japanese version and the global version. The Japanese version is a little further along in its development cycle. In any case, Fate/Grand Order is a perfectly good gacha game, even if you don’t know the anime series very well. Final Fantasy Brave Exvius is one of a number of Final Fantasy gacha games. Most of them are pretty good, but Brave Exvius is just one step better than the rest. It’s very F2P friendly. Additionally, it comes with a long story line, tons of units to summon, a lot of special events, and plenty of other things to do. Those who like the idea, but don’t like Final Fantasy can try Brave Frontier by Gumi. It’s very similar in its turn-based jRPG mechanics and character upgrade style. Final Fantasy Brave Exvius has one of the best mobile game soundtracks ever. Final Fantasy Record Keeper and Dissidia Final Fantasy Opera Omnia are also pretty decent. Fire Emblem Heroes is Nintendo’s foray into the gacha games world. Thankfully, Nintendo did a pretty good job. This game is relatively rock solid with fun, colorful graphics and tons of stuff to do. There are a variety of characters to summon from the Fire Emblem series. It uses strategy RPG mechanics just like the console games. We also like the little things about this game. For instance, Nintendo tells you the percentage chances of summoning the really good units. It’s fairly F2P friendly and just straight fun to play. Its freemium elements are fine, but aggressive as you would expect. One Piece Treasure Cruise is one of the most popular gacha games on mobile. That makes sense because One Piece is one of the most popular anime shows ever. The game features over 1,000 characters to summon and collect. That gives it the biggest cast of any game on the list. It uses jRPG combat mechanics and it has a ton of quests, missions, story line, and other activities. It’s a truly massive experience much like the anime itself. You’ll spend a lot of time with this one. Most of the issues and complaints we saw were from stability and Internet connectivity problems. Shin Megami Tensei is a popular jRPG series mostly on PlayStation and Nintendo consoles. 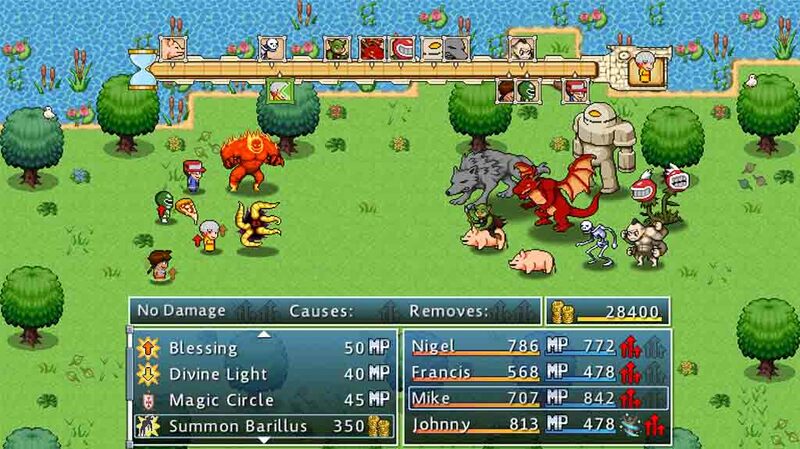 The mobile RPG is one of the newer entrants into the series. It features over 160 characters to summon and use. Additionally, you get simple jRPG mechanics, plenty of events, and basically all of the other perks of the gacha game genre. You can probably see the pattern by now. This one also includes decent cut scenes and above average storytelling, much like its console counterparts. Of course, it also comes with PvP elements and other typical gacha stuff. It’s pretty good, even if it’s newer. Sword Art Online: Memory Defrag is one of a few SAO games on mobile. We like this one the most, though. Players can play with traditional RPG roles and then also summon a ton of characters from the series. This one features a decent story, co-op missions, guilds, and other social elements. In fact, Memory Defrag has one of the most vibrant online social community tools of any game on this list. It’s also okay for F2P players, although you may get a better experience elsewhere if that’s what’s most important to you. Like most, the biggest complaints are bad pulls and Internet connectivity issues. Valkyrie Connect is one of the older gacha games. Its maturity gives it a little more content than most newer gachas. The game features a story line, plenty of special events, an online multiplayer mode, The multiplayer includes both competitive and co-op modes. The mechanics are simpler than normal. Also, this game isn’t quite as friendly to F2P players as some others on this list. It’s a fairly solid game overall. Most of the complaints we found were for consistently bad pulls, Internet connectivity issues, and other such things. If we missed any great gacha games, tell us about them in the comments! You can also click here to check out our latest Android app and game lists! Previous articleWeb Apps: Client-side Rendering? SSR? Pre-rendering?